The HAL’s Helicopter Division in Bengaluru received the first batch of helicopter structures and sub-assemblies manufactured by HAL subsidiary Naini Aerospace Limited (NAeL), Prayagraj for Advanced Light Helicopter (Dhruv). The ‘Certificate of Conformity’ of sub-assemblies and bottom structure assembly was formally handed over yesterday at a function in Naini. Mr. R. Madhavan, CMD, HAL had recently launched the state-of-the-art structural assembly shop for production of helicopter structures. A robust quality management system is in place cleared by the joint audit team of DGAQA and HAL for manufacturing of aircraft loom and structural assembly, he says. Speaking on the occasion, Mr. V.M. 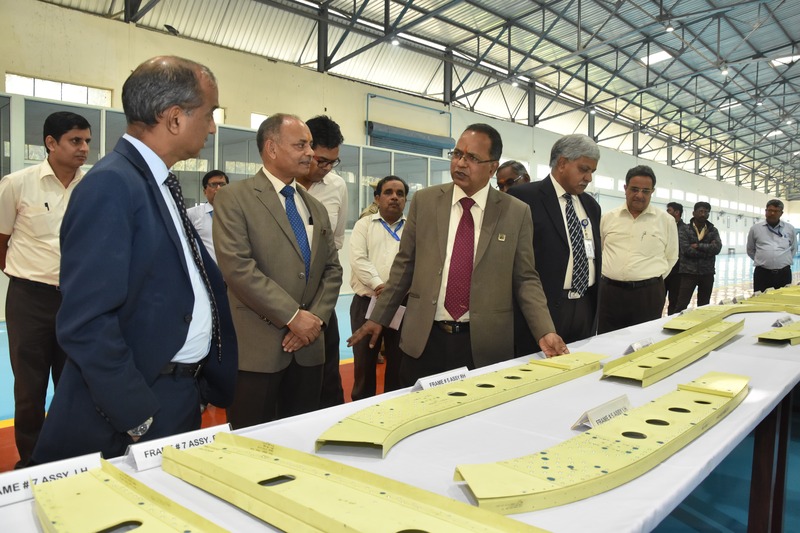 Chamola, Director (HR)-HAL and Chairman (NAeL) hailed the efforts of NAeL employees in acquiring skills in the difficult domain of manufacturing of aero-structures. With the handing-over of helicopter structures, NAeL has now developed capabilities in the field of aero-structures apart from aircraft loom manufacturing, he added. Mr. V. Natarajan, Executive Director, Helicopter Division-HAL received the documents from Shri R.K Mishra, CEO (NAeL). Jig-out of bottom structure of ALH was performed by Mr. GVS Bhaskar, CEO-HC and Mr. Shekhar Shrivastava, CEO-BC, HAL inaugurated the Gate Complex of NAeL in separate events. Currently, the NAeL is executing the HAL order for five sets of ALH (Dhruv) structural assemblies. About NAeL: The Naini Unit of sick Hindustan Cables Limited was closed for nearly 15 years. It was taken over by Naini Aerospace Limited (NAeL), a subsidiary of Hindustan Aeronautics Limited on February 1, 2017. The ageing manpower of HCL was absorbed in the company and was provided extensive training for acquiring necessary skills in aerospace sector. The repair, renovation and infrastructure for aero-structures and aircraft loom manufacturing was created in a record time of one year, apart from securing factory license, statutory taxation, labour and EPFO registrations required for production and business operations. The company commenced production activities of wire harnesses of helicopter and aircraft in July 2017 within a time frame of five months after being taken over. The company had earlier made its maiden delivery of aircraft looms to HAL on March 27, 2018. It has so far manufactured over 600 aircraft looms for ALH Dhruv and LCA Tejas aircraft.